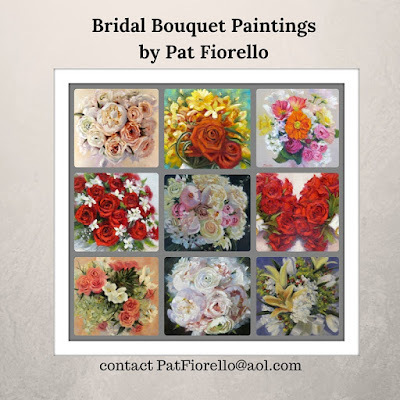 "Celebrate" is a recent painting of a bridal bouquet, commissioned by a mother of the bride as a Christmas gift for her daughter. 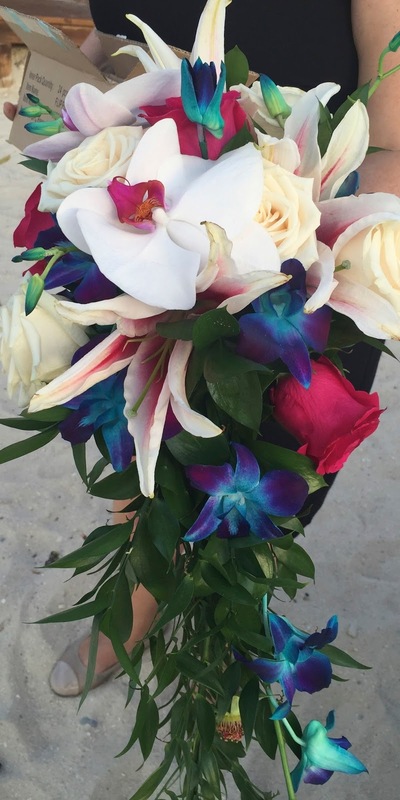 The wedding was a beach wedding this past July and the bouquet had a festive red, white and blue theme. She sent several photos and I cropped in close and manipulated a bit in photoshop. 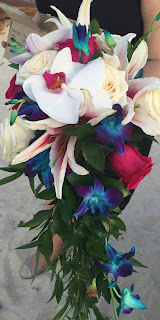 We both preferred the slight angle view and since the bouquet had a long cascade, I thought the elongated format might be really nice. These are some other examples of bouquets I've painted for other brides. 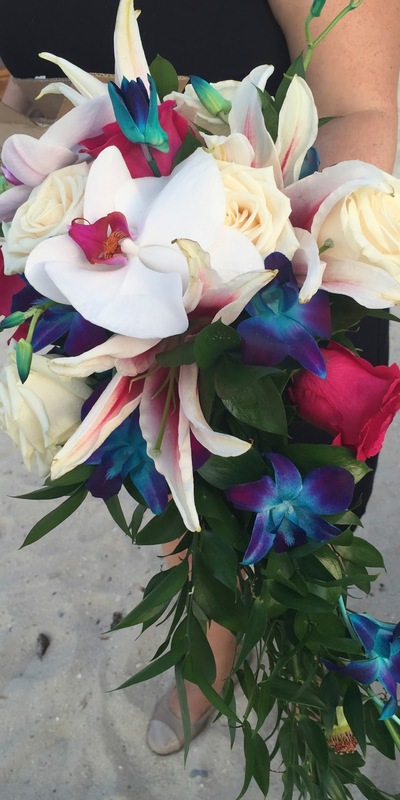 If you'd like to have a bouquet painted as a unique and meaningful gift for a wedding, anniversary, Valentine's Day or other special occasion coming up in 2016, please contact me for a complimentary design session. 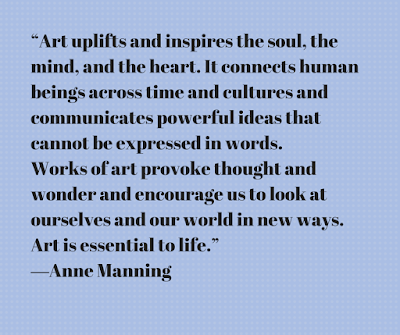 Artists create art for a number or reasons, and often it is something they feel personally moved to create or express. 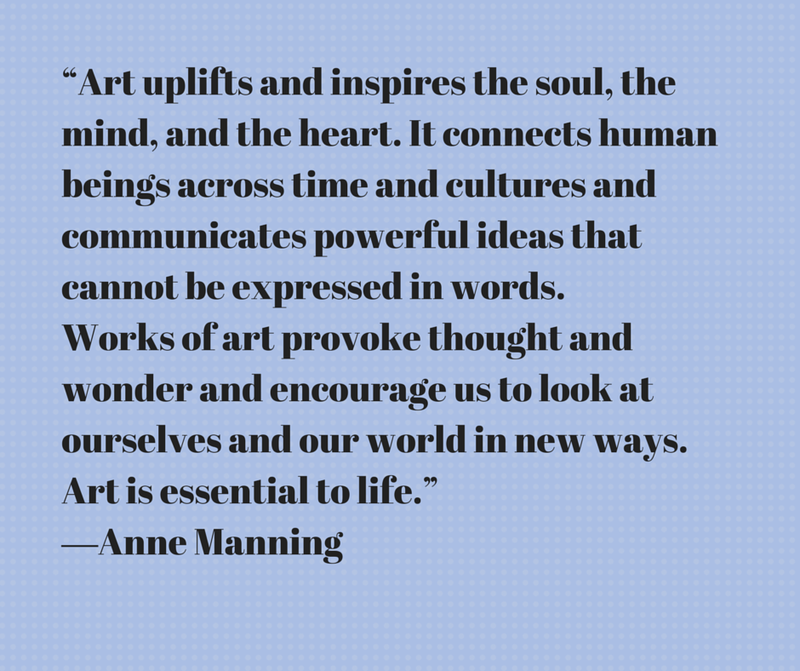 However, art can be much more than an individual phenomenon. 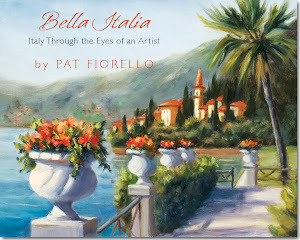 While I am passionate about art and find joy in painting, there is also a broader context to art for me and that is to uplift spirits and enrich lives through art and beauty. 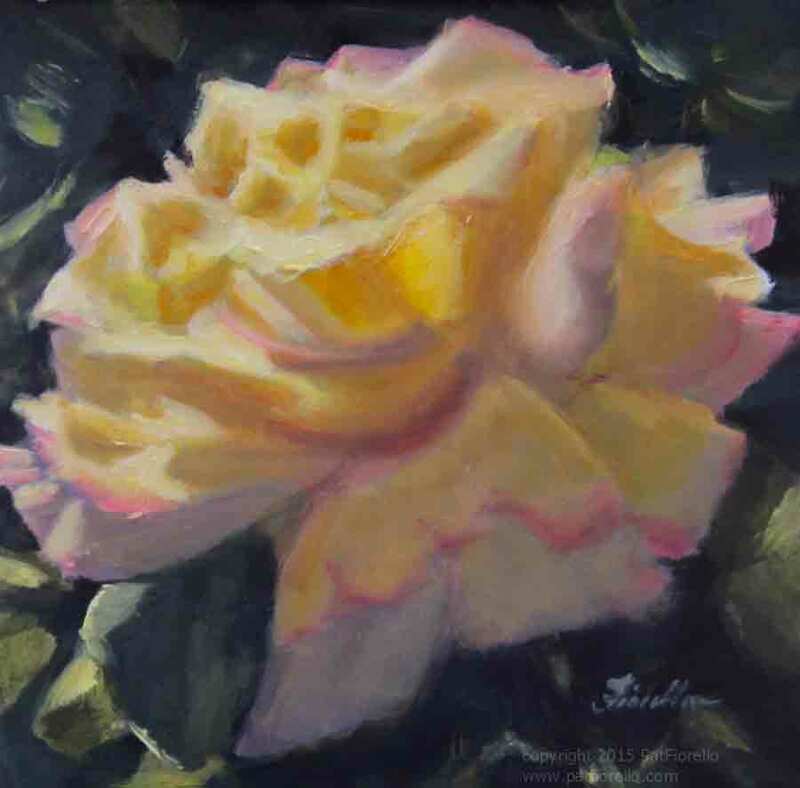 The personal context I have held for many years now and which has been my "true north" is that I am " Creating a World of Beauty, Love and Inspiration". Aligned with this purpose, earlier this year I created a program, "Inspired Spaces" where I donate art to places where people are receiving medical treatment or healing. There is a growing body of research evidence that seeing nature and beauty has a significant impact on recovery for patients. In one landmark study, hospital patients who saw trees required less pain medication and requested it less frequently, were less anxious and depressed and were able to leave the hospital faster than those who looked at a plain brick wall. Another study revealed the healing power of art and nature actually boosts ones immune system by lowering levels of an inflammatory chemical that can trigger diabetes, heart attacks and other illnesses. 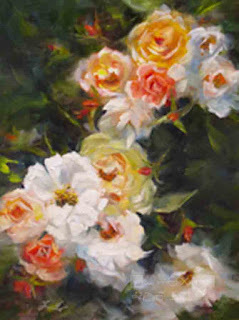 There are countless other studies showing the healing power of art and more and more research being done in this area. Typically, for my "Inspired Spaces" projects, I offer to donate one of my existing paintings, but when the folks from Ronald McDonald House shared the development of a brand new facility in Dunwoody, GA, I agreed to paint something specifically for them. 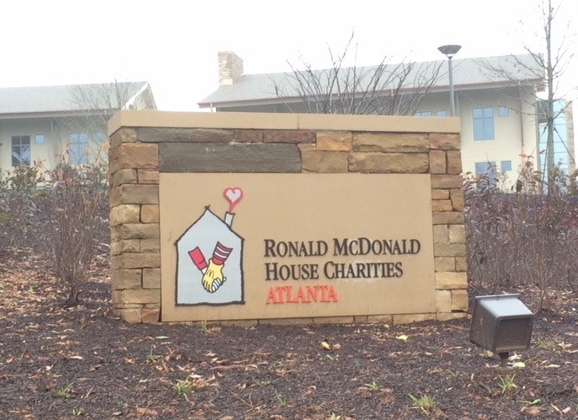 The new facility replaces a former house that only had 11 bedrooms which meant many families in need had to be turned away. The new building just opened and has 31 bedrooms for families to use while their child is receiving extended medical treatment here in Atlanta. I met with Jennifer Davis, a designer from Sims Patrick Studio, the local firm who worked on the design and decor of the new facility. 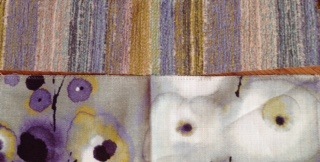 She shared some of the fabrics and I then translated those into some paint colors that I would use in a limited palette. The new building has a bit more of a contemporary palette and feel so I created the painting "Hope" with a bit more of an abstract feel rather than something strictly representational. 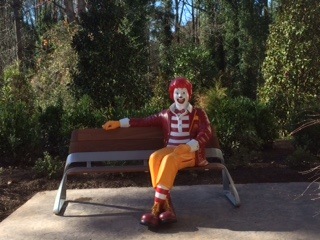 The centerpiece of the new building is a unique and innovative tree house in the center of the building that reaches up to the highest floor. 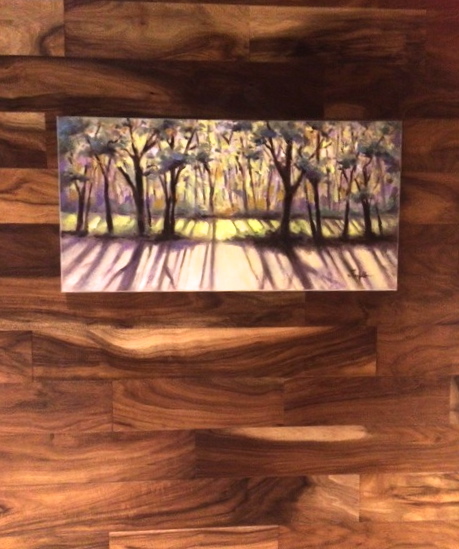 Here's the painting hanging against a wood covered wall. If you know of an environment that could be enhanced with some artwork for the benefit or patients and caregivers, please have them contact me about my "Inspired Spaces" program. 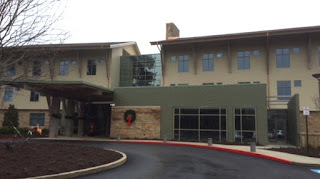 Best wishes to all for a happy holiday season and a miraculous 2016! 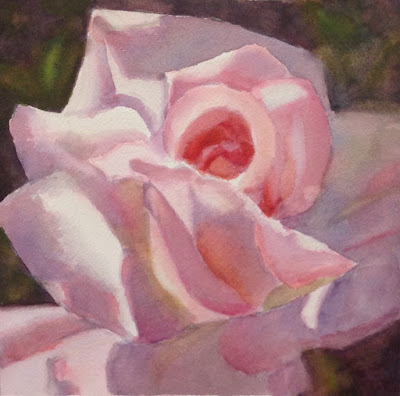 I have several different methods for painting flowers. 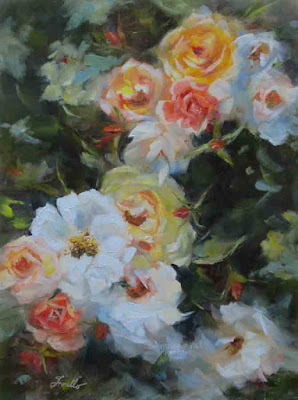 Most are "alla prima". 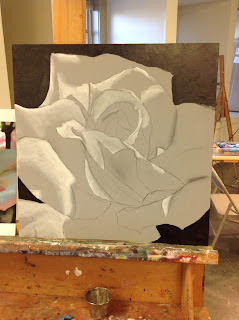 Sometimes I start with a transparent underpainting, then build opaque colors on top. Other times I put dark background in and lift out the spaces where the light flowers will go. And sometimes I lightly sketch in the flower shapes, build shadow shapes, then light shapes and refine from there. Recently I attended a workshop given by Brian Davis. His method is quite different from any of these more direct methods I typically follow. So I have been experimenting to see what that approach might be able to achieve or if there are elements of it that I might incorporate into my own process. 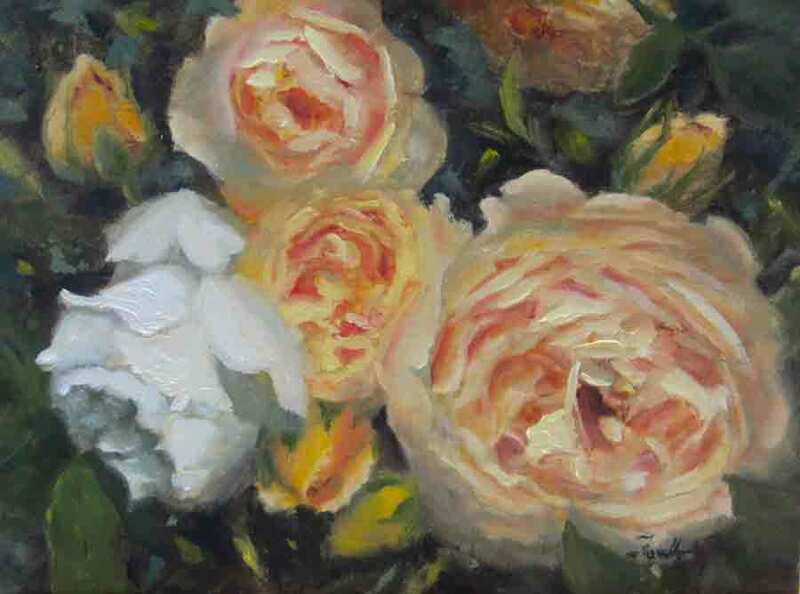 A few days ago I shared "Close Friends" 12 x 16 oil which I did in my own way. I decided to give the same composition a try with this new method and see the difference. Below is the start with this new method where you start with a middle value grey and then build up the pattern of lights and darks, leaving the original grey tone to show thru where the midtones will be in the composition. After that underpainting (or grisaille) dries, then you build colors on top of it. 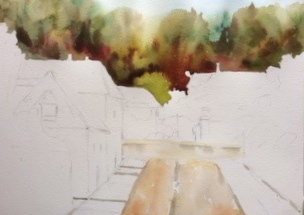 If multiple layers are required (which is usually the case), then you must wait for the previous layer to dry. To speed up the process a bit, you can use oil alkyds which dry faster than traditional oils. But even with the faster drying you'd still most likely have to wait till the next day, so it ends up being a multi- day process as opposed to more direct methods. Below is the same painting done in my own method initially. The "experiment" is posted at the top of this post and to be fair is an 8 x 10 so a little less detail was included than the larger version. When I look at them side by side, the "experiment" may have a bit more depth, however that could be achieved in the other method as well, glazing over a few areas to deepen the values if desired. 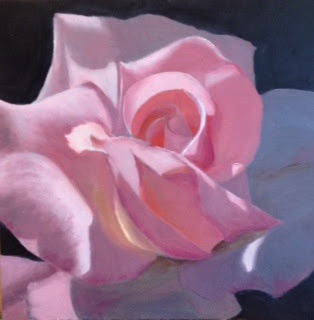 I think the grisalle method helps you stay true to the values as you get into color, however, since I usually have a value sketch before I start painting, I usually have a road map on where I'm going during the painting process. My conclusion thus far is that you can arrive at the same place in a number of different ways. 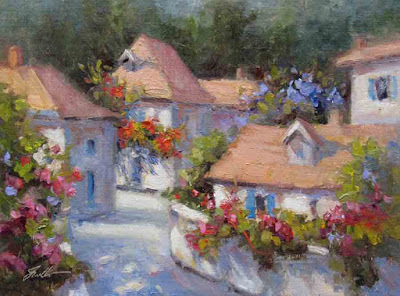 As Richard Schmid says, painting is all about having the right shapes of the right value and color in the right place. Sounds easy, but my fellow artist know it takes practice and lots of work to achieve that. I'll continue to experiment with this new approach although I don't see it replacing my current methods. It's good to have options to explore. Do you see anything else comparing the two? Have you experimented with different methods? Would love to hear what you've learned by doing so. Experimenting with a new technique I recently learned which involves laying in a grisaille underpainting and once dried painting on top of it, as opposed to the more direct alla prima approach I typically use. Aim was to capture a sensation of light on this rose in the garden. 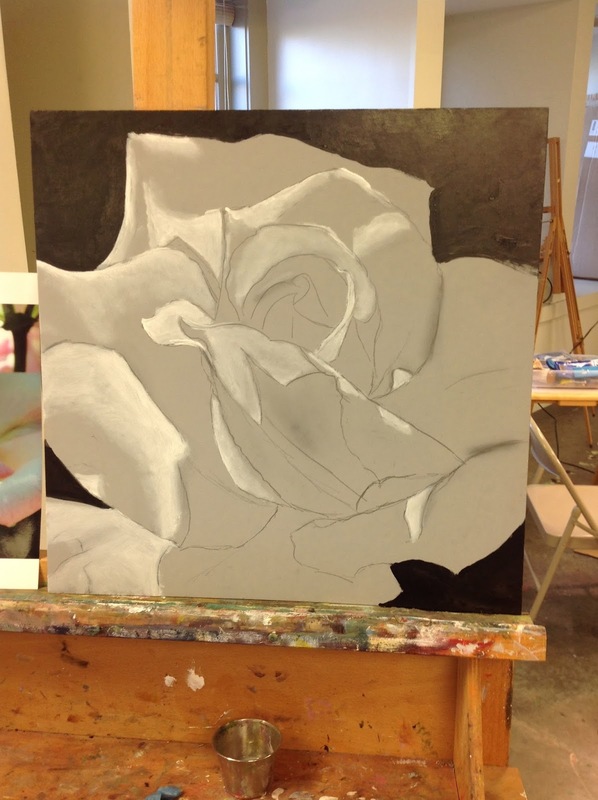 Below is the painting after the underpainting of values in black, white and grey were laid in. I've gotten more interested in painting flowers up close in the garden setting as a change of pace from the still lifes. I've decided to pursue these "gardenscapes" further and to create a series for an upcoming show next spring. I called this one "Close Friends" as I like the intimate feeling and viewpoint and that the roses of different sizes and stages of development are clustered close to one another. Latest oil painting. My focus was conveying a sense of light and energy with these beautiful flowers. 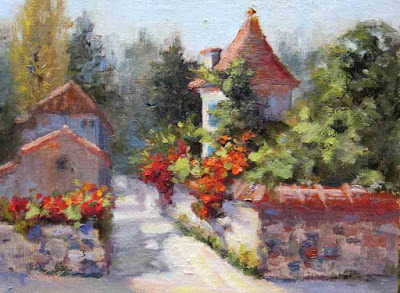 An oil version of the same scene shared in the watercolor version a few posts back. Autumn in Giverny . 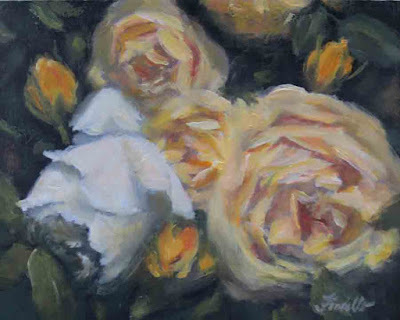 After looking again at "Roses Alla Prima" which I had painted a couple of months ago, I realized something had been lost in the translation from the study which was 8 x 10 to the larger 12 x 16 version. Since the proportions were slightly different, the composition looked a little bit empty. Below is the original. I added a just few more brushstrokes and feel the new version above is stronger. Rose Sweet Rose- Could it work in Watercolor? 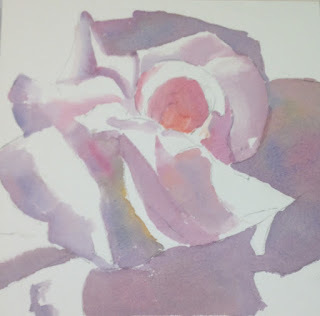 In a post earlier this week, I shared a totally different painting approach I learned during a recent oil painting workshop. 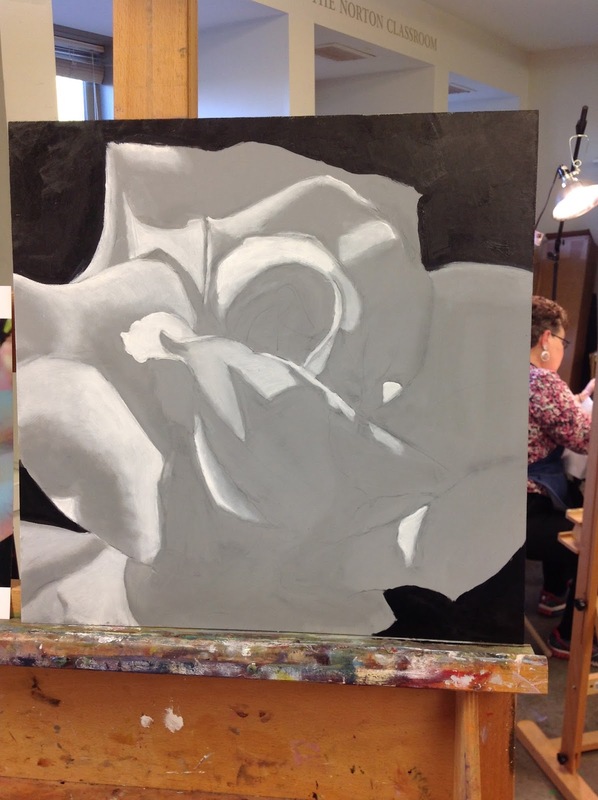 Rather than my typical more direct "alla prima" approach, this alternative approach involved a grisalle( black and white value underpainting, after drying add colors, layers as needed). I decided to do a little experiment to see if that approach of putting values down first then painting color over it would work for watercolors. 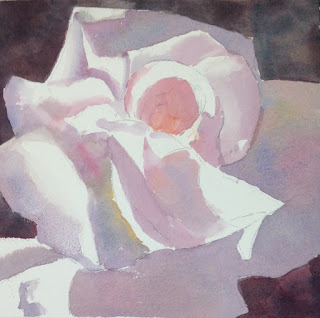 It may be a somewhat non-traditonal approach for watercolor which typically is painted from light to dark, but after doing this experiment, I think it is a viable approach. Here's the first stage, where I painted in just the midtones with a grey made from permanent rose, cobalt blue and indian yellow- a primary triad that is fairly transparent. Rather than mix up a big batch on one flat color, I shifted the predominance of different colors based on areas of the photos which showed warmer versus cooler passages. 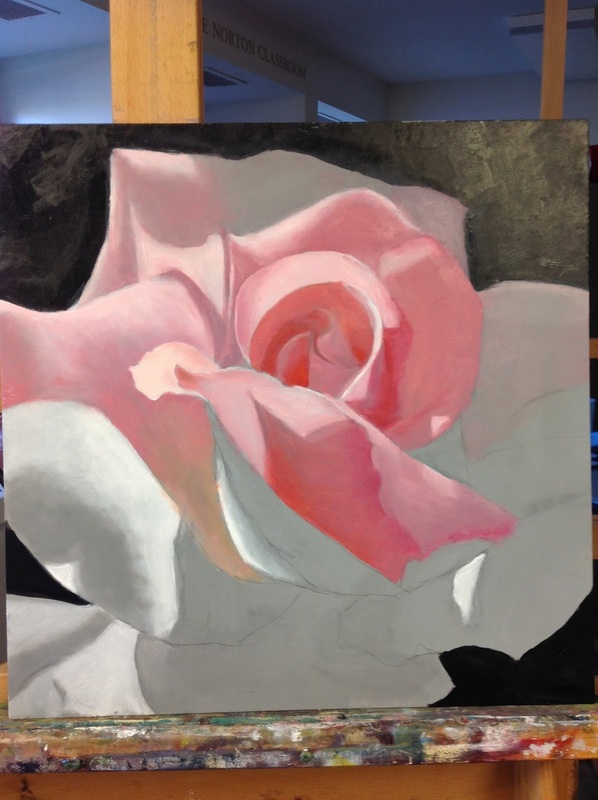 I also tried to be mindful of where there were soft transitions instead of hard edges and started softening the edges at this early stage knowing it is harder to do once the paint is dry. Once that layer dried, I added the darks and let the whole painting dry overnight. 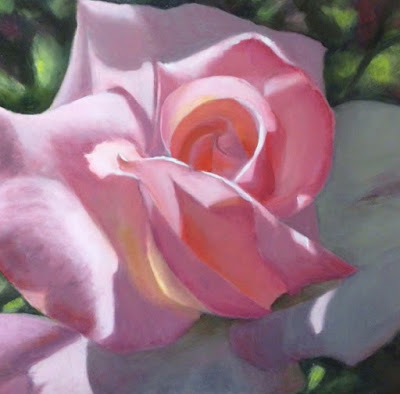 The next day I came back with color over the underpainting, resulting in the finished painting at the top of this blogpost, "Rose Sweet Rose". 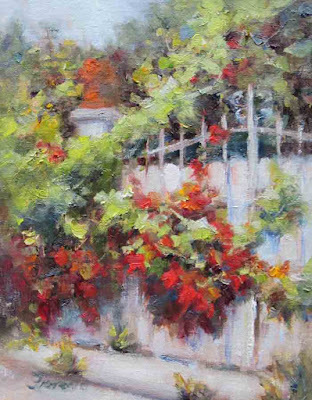 I've painted this gate before after my trip to Giverny, France last June. 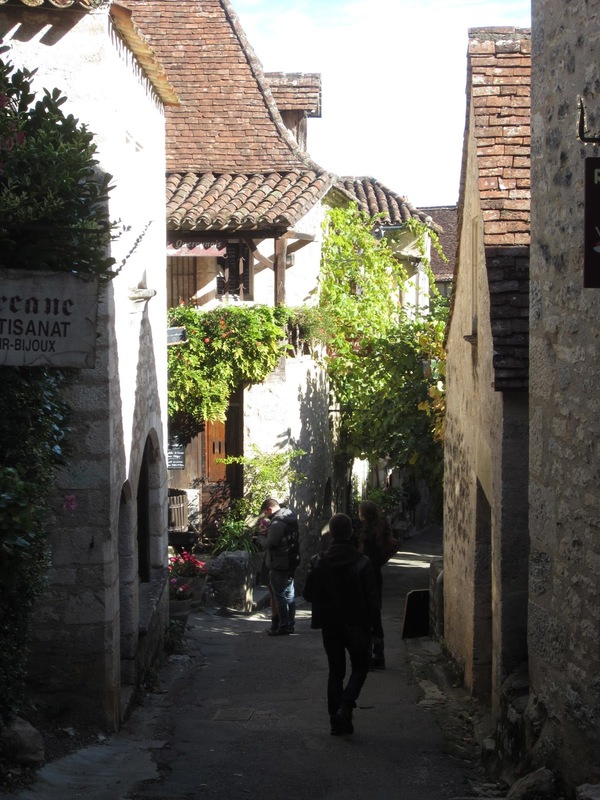 It's in front of a home once purchased by Monet for his grown children, 27 Rue Claude Monet. 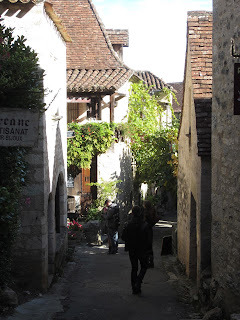 I've been to Giverny 5 times, but this was my first visit there in the fall and the town was just spectacular with the rich fall colors. One trait common to most artists is the continual quest to keep learning and growing. I've been painting for over 20 years, but am always on the lookout for new approaches, methods, tools, inspiration to grow as an artist. To speed up the process during the 3 day workshop, we used Alkyd oil paints, which dry faster than traditional oils. this already was new as I had never worked with the Aklyds before. They dry slower than acrylics, but faster( usually overnight) than oils. 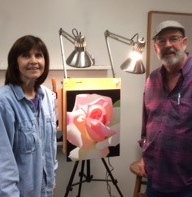 Here I am with Brian and his partially completed demo painting. Day one we created a grisalle by adding white and black aklyds for light and dark shapes on a panel painted with a midtone grey acrylic underpainting. Day 2 , after the initial layer was dry we further developed the grisalle. Day 3, we finally moved on to color. Further development once I got home on Sunday and the final painting above "Rose Sweet Rose" was completed on Monday. Simple value sketch of large shapes of light, medium and dark. 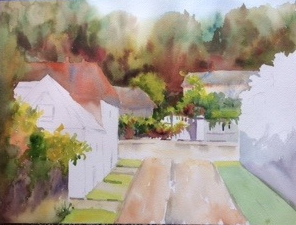 I don't always do this but since the small fence with the leaves draped over it was my intended center of interest, I decided to get the intricate shapes and colors in there next. 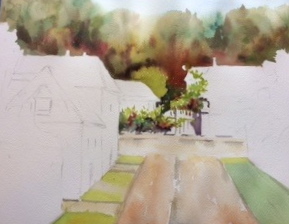 Continue laying in remaining areas and adjust values and edges as needed. 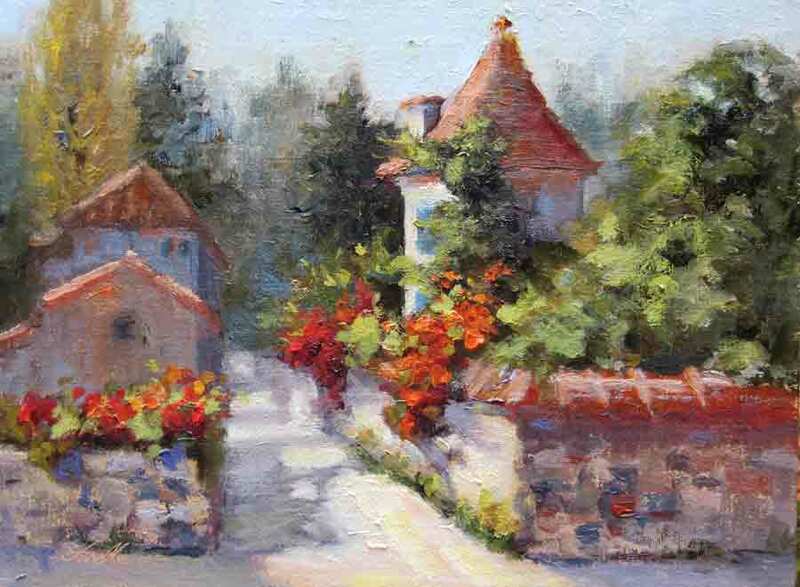 Another scene from France embellished to fill in for flowers that I imagined might have been there during Springtime. Painted this study on location in Saint-Cirq-LaPopie, noted as the most beautiful small village in France by the French people themselves. It was a stunning town with lot lots of scenes to paint. I'm sure I'll revisit my photo's from that day for further painting inspiration and I'd love to go back in the spring or sumer to see what it looks like when full of flowers. 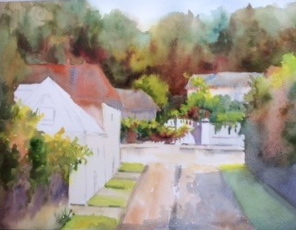 When choosing a location to paint, I like to go with what captures my heart. A scene I walk by and often literally gasp. Over time you might notice you are drawn to similar scenes. I have certain themes I return to over and over. I can't resist sunlit vines. 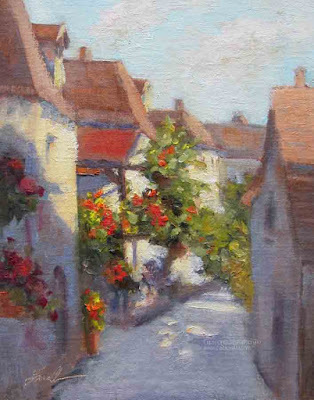 They have interesting, dynamic shapes, that have a sense of movement and the dramatic lighting and shadows. They just make me feel happy! I used the basic architecture and light and shadow patterns here then further embellished the scene with some colorful flowers. 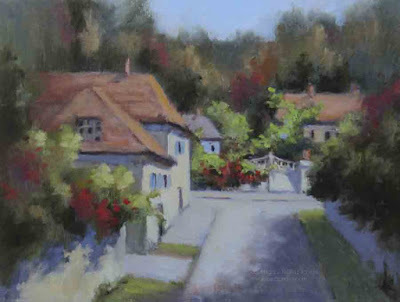 Had permission from Marilyn Simandle to copy one of her demo paintings of France. 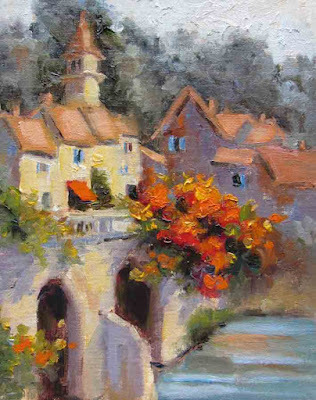 While one should not copy with the intent to sell of show another's work ( a copyright infringement), with permission and disclosure, it can be a very good learning experience to copy another painting, just as many have copied the masters before us.